Gas Turbine Market size will exceed 34 GW by 2024, as reported in the latest study by Global Market Insights, Inc. Global gas turbine market within the prevalent industrial regime has positively been influenced with regulatory and consumer inclination towards energy optimization. Growing environmental concerns coupled with stringent government mandates to curtail emissions have aligned focus towards the integration of effective energy conservation measures. Pivotal for this evolution has been the re-structuring across key power markets along with rapid technological enhancements including the field of aerodynamics, combustion, materials and cooling which in turn nourish the industry landscape. The U.S. gas turbine market is anticipated exceed an annual installation of 5 GW by 2024. Expansion of research and development investment reforms and shifting focus towards effective combined cycle generation plants will drive the product demand. As per ICF International in 2016, turbines fabricated by U.S. based manufacturers contributed to 80% of the operating natural gas-fired combined cycle plants across the nation. 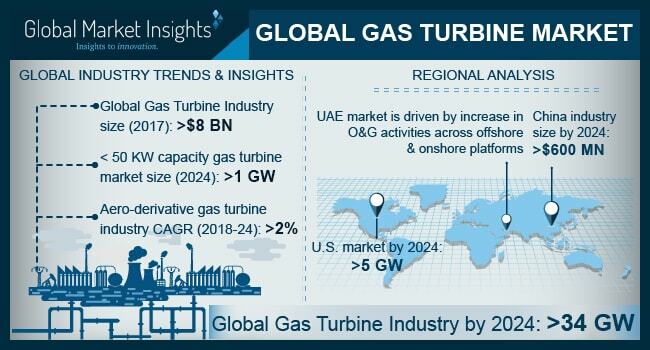 > 200 MW gas turbine market is set to grow owing to significant applicability across large manufacturing plants, industries and power generation units. The products are adept with effective fuel efficiency, environmental proximity, and longer life cycle with comparatively lower costs. Furthermore, enhanced operational performance coupled with large capacity integration and flexibility, conceal cost associated issues which in turn favor the deployment of these products. Ongoing deployment across process industries favored by replacement of conventional fuel by sustainable resources in a host of small scale industrial applications will thrust the overall gas turbine market size. Although, across import dependent emerging markets, especially those without a mandate on carbon or strict reforms on air pollution, these products face strong competition from conventional technologies. However, ongoing technological proliferation coupled with evolving consumer and regulatory proximity in line with the deployment of effective turbine units will complement the business outlook. China gas turbine market is projected to grow on account of ongoing expansion of large scale gas fired power stations coupled with positive clean energy outlook across the nation. Leading manufacturers across the globe have aligned their focus towards business expansion across the Chinese industry. Siemens in 2018, fetched orders to supply its two H-class gas turbines & associated components for the CHD Guangzhou Zengcheng CCHP project. Operational efficiency, effective environmental proximity, lower overall operational cost, and effective waste heat utilization are few imperative factors driving the combined cycle gas turbine market size. Resurgent industrial headway coupled with rising energy demand and stabilization of gas prices have instituted a favorable business scenario. In addition, overburdening of existing energy resources including coal and hydro power in conjunction with regulatory focus towards energy optimization will further foster the overall industry potential. Prominent participants in the gas turbine market include Siemens AG, General Electric, Wartsila, BHEL, Mitsubishi Hitachi, Kawasaki, Solar Turbines, Ansaldo Energia, Opra Turbines, Vericor, Capstone Turbine, Man Diesel & Turbo, Cryostar, Harbin Electric, Zorya-Mashproekt, and NPO Saturn.